This £430k (2005-2008) standard grant, funded by the ESRC-NERC-BBSRC Rural Economies and Land Use (RELU) Programme, is designed to evaluate the impact of management practices to control the risk of pathogen transfers from grazing livestock, manures and other waste streams on the economics and practicalities at the farm level, and the 'knock-on' effects of such decisions on local communities and industries reliant on clean water supplies. Conventional intensive livestock food chains provide consumers with cheap and reliable sources of milk and meat, but there are unseen and un-costed environmental and social costs in terms of the waste these food chains generate, and the manner in which waste is recycled to land in rural areas. The management of livestock and manures needs to be carried out in such a way as to minimise the risk of pathogen transfers to grazing and cropped land; to water supplies that themselves are used in the food chain (e.g. livestock drinking water and agricultural irrigation); to watercourses that are used by local industries (e.g. shell fisheries); and to recreational water bodies such as bathing waters. 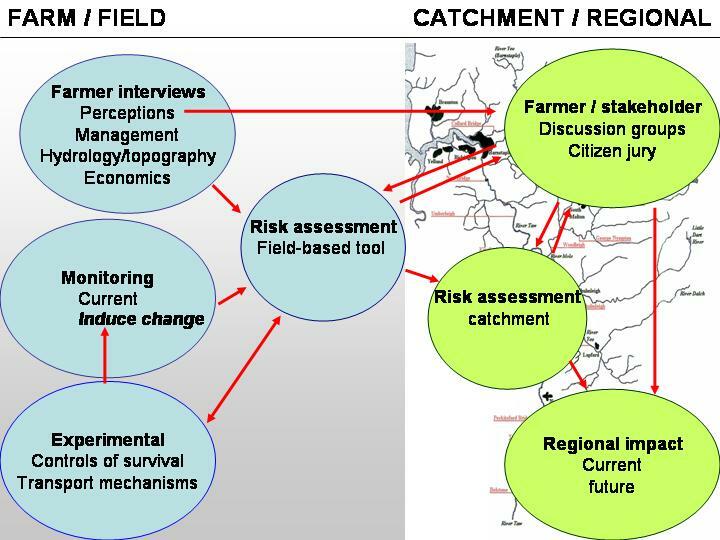 The project brings together expertise on farmer decision making, farm business economics, consumer interests, the food chain, manure/residue management, pathogen transfers and the development of risk assessments for diffuse pollution. The research will be undertaken in the Taw catchment in Devon because it is livestock dominated (dairy); the impacts on bathing waters and shell fisheries are well documented; and public interest in rural environmental issues is high following from the 2001 foot and mouth epidemic, which had a major impact on the region.